Steffi has been a selective mute for most of her life – she’s been silent for so long that she feels completely invisible. But Rhys, the new boy at school, sees her. He’s deaf, and her knowledge of basic sign language means that she’s assigned to look after him. To Rhys it doesn’t matter that Steffi doesn’t talk and, as they find ways to communicate, Steffi finds that she does have a voice, and that she’s falling in love with the one person who makes her feel brave enough to use it. 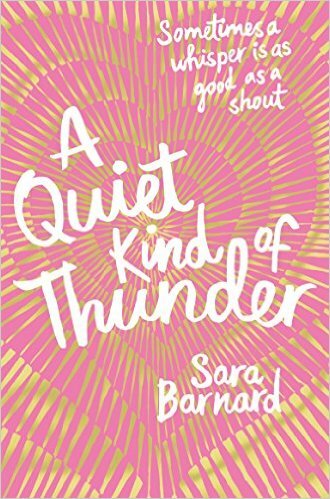 Last year I read Beautiful Broken Things by Sara Barnard, and thoroughly enjoyed it. I was really looking forward to reading this, her new book, but sadly, overall, this book didn’t quite live up to her first for me personally. Stefi is a selective mute. Rhys is deaf. They are able to communicate with each other using sign language, which works for both of them, and they find themselves forming a strong bond with each other almost immediately. I found the different ways the two found to communicate with each other to be really interesting, and I also felt for Rhys, who had decided to attend a normal sixth form but wasn’t well provided for. Despite this, he’s a strong and determined character. Stefi, meanwhile, battles her own demons, but finds that having someone to communicate with in sign language helps her to regain some confidence. It was also interesting reading about Rhys and Stefi’s families, and I felt that I could definitely see where Stefi’s parents were coming from when they worried about her so much – even when this worry was sometimes unjustified. I sometimes find in young adult novels that diverse characters are shoehorned in, and it can often feel contrived. But I think this book really nails the diversity aspect incredibly well, and what made this work for me was that the characters were a natural part of the story, instead of it being obvious. However despite the positives, this novel didn’t seem to me to be as complex or interesting as Beautiful Broken Things, and it did feel like a fluffy romance a lot of the time. Beyond the issues faced by the two protagonists, there just wasn’t enough here to keep me interested, and although the book was perfectly nice and easy to read, there really was nothing that made me want to pick it up each time I stopped reading. Rhys and his family are all just a bit too sweet and perfect, and there just didn’t seem to be a meaty enough plot here to keep me going, and it definitely lacked something for me overall. But there is still enough here for me to think this is a good, worthwhile book with very positive representations of a range of characters. I wish there had been a bit more plot-wise, but I think many readers of young adult novels will still enjoy this.